This is a new release of a most popular game for Palm OS 4 and HiRes. It has improved graphics and lots of new effects. 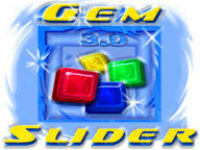 Four game modes and several skill levels varify the game play and make Gem Slider more addictive than ever.